Leaders Are Readers—Read Today, Lead Tomorrow! We Can Help You, Your Company, Organization and Community Grow Too! e support people in changing their lives, discovering their purpose, reaching their goals and objectives, and making their dreams come true. Our mission is to help people grow and become the best they can be, and make a difference in the world as they help others. e're committed to providing quality books, creatively written, to help people lead happier, more successful lives. We promise to publish books that are easy to read, understand, and apply—with covers that inspire and excite people into action! 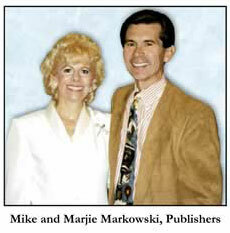 Watch Mike Markowski on "To Tell The Truth" circa 1973.
ur company has been publishing books since 1976, and we've been in the personal and business development arena since 1987. We bring a rich background to the publishing business including counseling, personal and business training, and motivational speaking. The more people we reached, the more empathy we felt for the human condition—and helping others grow. e saw a great need for books sensitive to the needs and challenges of people building their careers or businesses, as well as their personal lives. Inspired to use the challenges, experiences, and talents we were blessed with, we have dedicated ourselves to creating these books and sharing them with others. e look forward to serving you the best way we know how—as your partner in success! To better serve you, we are committed to running a cheerful, helpful, courteous, knowledgeable operation—with integrity, based on biblical standards. We are here to provide you with the best books we possibly can.